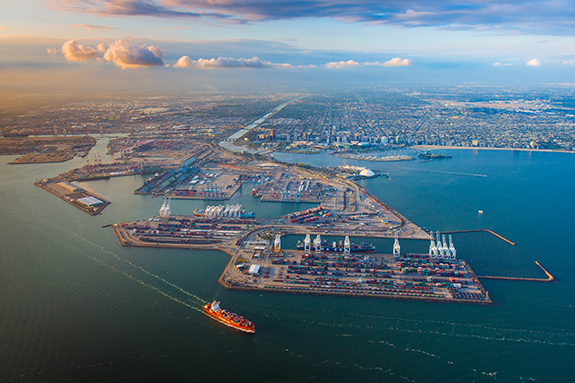 The Port of Long Beach will build and demonstrate a $7.1 million “microgrid” to show the promising new technology’s effectiveness in providing a clean, reliable supply of electricity for critical operations at the nation’s second-busiest seaport. With the help of a $5 million grant from the California Energy Commission, the Port will install a solar carport, power storage systems and advanced controls at its security headquarters, the Joint Command and Control Center. As part of the project, the Port will compile and analyze 12 months of performance data, and make that information available to other California seaports. The goal of the California Energy Commission’s grant is to accelerate development of microgrids, which are seen as important tools for improving effectiveness of renewable energy. And, because they offer a means of isolating from the grid, microgrids can improve participation in utilities’ demand response programs, where users agree to limit energy use during peak periods. The project also includes a workforce development component that will offer training opportunities through Long Beach City College and the International Brotherhood of Electrical Workers. Schneider Electric, an international leader in energy management projects, will design, construct and commission the Joint Command and Control Center microgrid. The project includes a solar carport at the Port’s security center, a stationary storage system and a mobile storage system that can be dispatched around the Port in lieu of diesel generators in case of outage.